The latest results from the EPICA core in Antarctica have just been published this week in Science (Siegenthaler et al. and Spahni et al.). This ice core extended the record of Antarctic climate back to maybe 800,000 years, and the first 650,000 years of ice have now been analysed for greenhouse gas concentrations saved in tiny bubbles. The records for CO2, CH4 and N2O both confirm the Vostok records that have been available for a few years now, and extend them over another 4 glacial-interglacial cycles. This is a landmark result and a strong testament to the almost heroic efforts in the field to bring back these samples from over 3km deep in the Antarctica ice. So what do these new data tell us, and where might they lead? 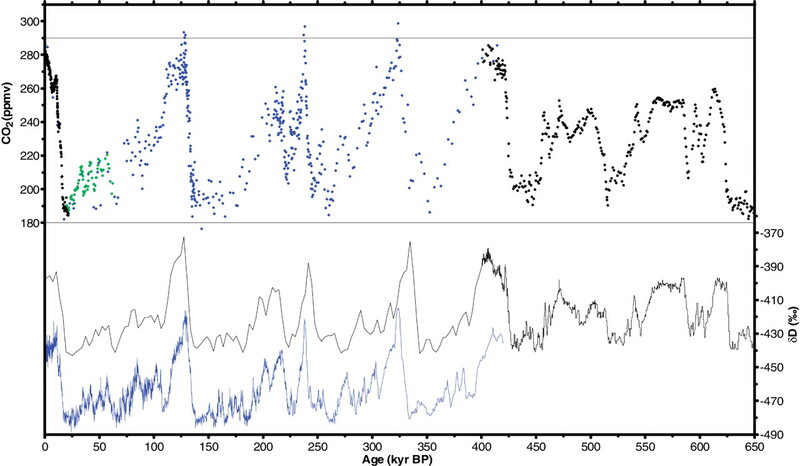 First of all, the results demonstrate clearly that the relationship between climate and CO2 that had been deduced from the Vostok core appears remarkably robust. 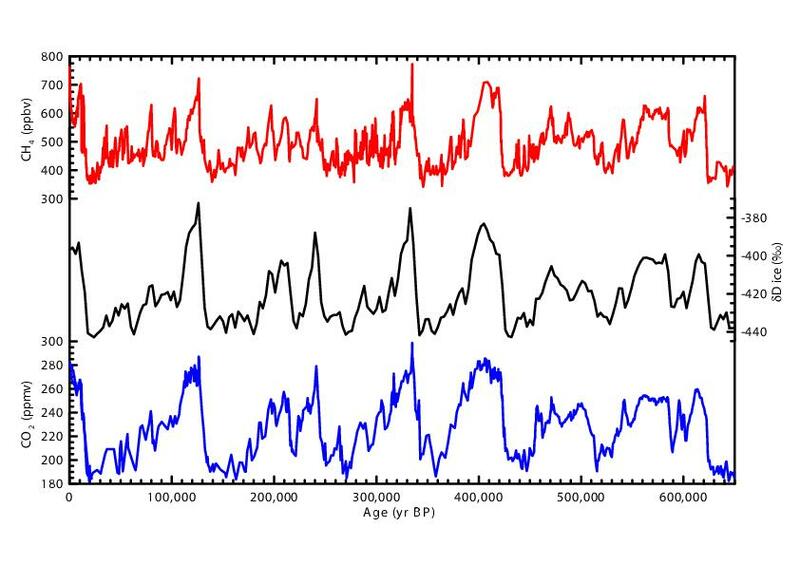 This is despite a significant change in the patterns of glacial-interglacial changes prior to 400,000 years ago. The ‘EPICA challenge’ was laid down a few months ago for people working on carbon cycle models to predict whether this would be the case, and mostly the predictions were right on the mark. (Who says climate predictions can’t be verified?). It should also go almost without saying that lingering doubts about the reproducability of the ice core gas records should now be completely dispelled. That a number of different labs, looking at ice from different locations, extracted with different methods all give very similar answers, is a powerful indication that what they are measuring is real. Where there are problems (for instance in N2O in very dusty ice), those problems are clearly found and that data discarded. Secondly, these results will allow paleoclimatologists to really look in detail at the differences between the different interglacials in the past. The previous 3 before our current era look quite similar to each other and were quite short (around 10,000 years). The one 400,000 years ago (Marine Isotope Stage 11, for those who count that way) was hypothesised to look more like the Holocene and appears to be significantly longer (around 30,000 years). Many of the details though weren’t completely clear in the Vostok data, but should now be much better resolved. This may help address some of the ideas put forward by Ruddiman (2003, 2005), and also help assess how long our current warm period is likely to last. More generally, since the extra interglacials that are now resolved have very different characteristics from the previous ones, they may allow us to test climate theories and models over a whole new suite of test cases. To quote Richard Alley “Whether you’re a physicist, a chemist, a biologist, a geologist, or any other “ist” studying the Earth system, there is something in these data that confirms much of your understanding of the planet and then challenges some piece of your understanding”. It’s all very exciting (for us ‘ists’ at least!). Update 1 Dec: Thomas Stocker sent in a better figure of the composite results for CO2, CH4, and the isotopes: .